Gov. 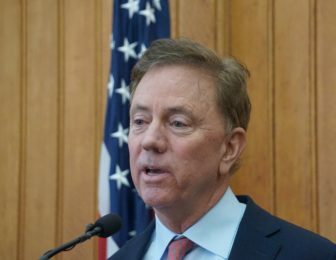 Ned Lamont wants to end Connecticut’s cycle of budget deficits, deliver property-tax relief and amass a fiscal bulwark against the next recession. But to do it, he may push wary legislators to extend the sales tax for the first time to groceries, medications and other long-exempt items. Lamont pledged during the 2018 campaign that he would not raise the income tax or empty the state’s budget reserves to close a shortfall of $1.5 billion projected for the coming fiscal year, saying neither of those measures would bring fiscal stability to a state that has struggled to balance its budget in every year but one from 2007 to 2017. While removing these exemptions could generate hundreds of millions more a year for the state’s coffers, Lamont would find it extremely difficult to sell lawmakers on the idea of taxing bread, milk, and medicine — even with the lofty goal of fiscal stability. The new governor’s first budget proposal isn’t due to legislators for another month. But his administration has been researching options to broaden the sales tax base and reduce the 6.35 percent rate across-the-board, a variation on a post-election recommendation made by the Commission on Fiscal Stability and Economic Competitiveness. The study group called for an end to most exemptions, but only a two-percent tax on groceries. Winning approval of a measure extending the state’s sales tax to groceries and other exempt items mostly likely would turn on the ability of the new and untested administration to frame Lamont’s first budget as the necessary first step toward ending the state’s chronic budget shortfalls. Expanding the sales tax would not break any campaign promise made by Lamont, but it would draw Democratic legislators, few of whom have close relationships with the new governor, into an uncomfortable debate about a tax that would be felt most deeply in the homes of the working poor and middle class. Mitigating that impact is a federal law barring the taxation of of food purchased through SNAP, the supplemental nutrition assistance program formerly known as food stamps. It now serves 384,000 individuals in 215,000 households in Connecticut. The sales tax is projected to generate $4.2 billion this fiscal year, the second-largest source of revenue for the $20 billion budget after the income tax. It also has dozens of exemptions, many dating back decades, that could raise another $2.7 billion if ended, according to the legislature’s nonpartisan Office of Fiscal Analysis. The exempted goods and services run the gamut from college textbooks to vegetable seeds, electrolysis services to winter boat storage. Critics argue no economic analysis of these types of breaks was performed before they were approved, and rarely are they re-examined. Senate Minority Leader Len Fasano, right, and former Sen. Tony Guglielmo, R-Stafford. Former Sen. Tony Guglielmo, R-Stafford, advocated repeatedly for a broader sales tax base during the first decade of the 2000s. Canceling exemptions and using the savings to lower the sales tax rate, he said, was simple fairness. Most of these are worth a few million dollars or less, a tiny fraction of the overall sales-tax stream. But there also are some large ones. The challenge, though, is that those have broader appeal. Consumers would pay an estimated $424 million more this year on groceries if the full 6.35 percent sales tax was applied. The exemption for prescription medication, syringes and needles saves shoppers another $387 million — or $416 million after the tax break for over-the-counter medications is included. To sell such a plan to Democrats, Lamont mostly likely would stress that the blow to consumers with limited incomes would be cushioned by his intention to support a higher minimum wage. Progressives are proposing to mirror Massachusetts, raising Connecticut’s current $10.10 minimum to $15 by 2023. The state also has an Earned Income Tax Credit that pays $118 million to the working poor. And Lamont wants a new “targeted relief” program that would eventually provide an average income tax credit of $700 to low- and middle-income families with hefty property tax burdens, though not immediately. “Residents and businesses deserve a true comprehensive research process and the final results will be delivered in Governor Lamont’s proposal to the General Assembly and the people of Connecticut next month,” McClure said. And the Democratic governor knows many will be watching. 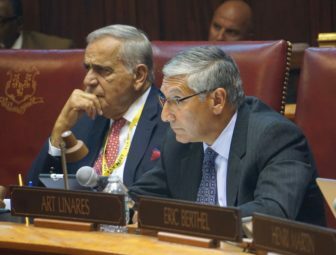 Republican legislative leaders said they’ll judge Lamont’s plan on two key criteria: How much tax relief is there to offset any new sales tax burdens? And does the new budget cut enough spending? 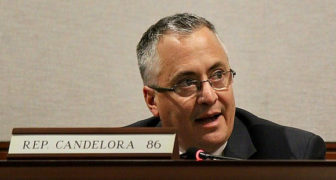 Deputy House Minority Leader Vincent J. Candelora, R-North Branford, said middle-class families won’t be too excited about property tax relief in two or three years if they pay even more in sales taxes. “The public is going to see it as a tax increase the minute it hits their bottom line,” he said, adding he also is wary of the impact of taxing groceries and medications in poor communities. 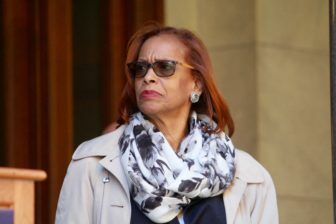 Democrats have similar concerns, even some who worked for Lamont’s election and served on his transition, such as Rep. Toni E. Walker, D-New Haven, the longtime co-chair of the Appropriations Committee. She said while there are many in Connecticut who want property tax relief, there are far more who buy groceries and medicine. “We’re struggling to try and get people on health care,” she said, noting that added sales tax burdens could lead some to ignore medical problems. The Connecticut Food Association, which represents the state’s grocers, said a new sales tax burden could be one part of a much-larger hit on stores and shoppers. For example, association president Wayne Pesce asked, what happens if a new sales tax charge arrives at the same time as electronic tolling and an increased Connecticut minimum wage? If Connecticut were to impose a sales tax on groceries, it wouldn’t be the first state to do so. According to the Tax Foundation, a Washington, D.C.-based tax policy research group, 14 states currently impose rates ranging from 1 to 5 percent. But none of them are Connecticut’s neighbors, including the other five New England states, New York and New Jersey. 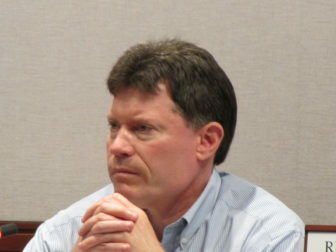 McClure said the administration envisions a solution that brings all stakeholders to the table. “The idea that everyone, absolutely everyone, agrees with is that we need a stable and structurally sound budget along with a clear and inclusive vision of what we want our future to be in order to provide our families and economic leaders the confidence they need to grow in Connecticut,” he said. But broadening the sales tax could be an important step toward growing the state’s economy. 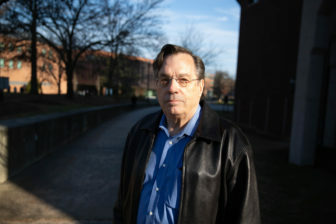 University of Connecticut economist Fred Carstensen, a longtime critic of the state’s fractured sales tax system says the web of exemptions is taking a toll. In seven of the nine years since the last recession, economic growth rates for the sales tax have ranged from 0.9 to 2.8 percent, according to the Office of Policy and Management. And analysts project annual growth ranging from 2.3 to 2.5 percent over the next three years. But while things appear stable, the sales tax is faltering according to one key metric. About 2.42 percent of Connecticut’s household consumption — what consumers spend after they’ve paid income taxes and saved or invested — went toward sales taxes five years ago, Carstensen says. Now it’s down to 2.2 percent. It’s because the state would be collecting an extra $220 million now were Connecticut consumers spending like they had five years ago. “This is not inconsequential,” Carstensen said, adding that if this deterioration is occurring while Connecticut is not in recession, what happens when the next, inevitable downturn occurs? The fix, he added, is a broader sales tax base and a lower rate. “You want to create the smallest amount of distortion, make it easier for businesses to apply so you have as stable of a revenue stream as possible,” he said.